This is going to be a short post. The great thing about this chicken curry - it is totally an awesome, fuss-free version of our Malaysian's favorite. 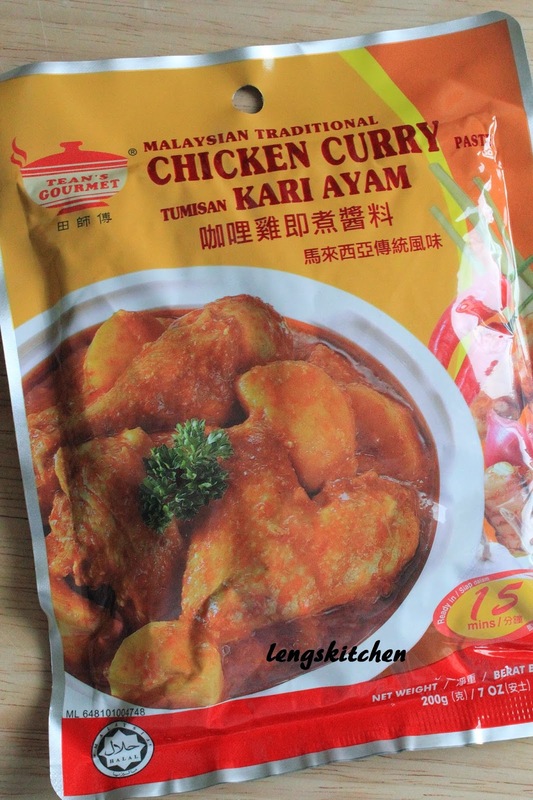 I have this instant chicken curry paste by Tean's Gourmet to thank for - a love at first try for me. 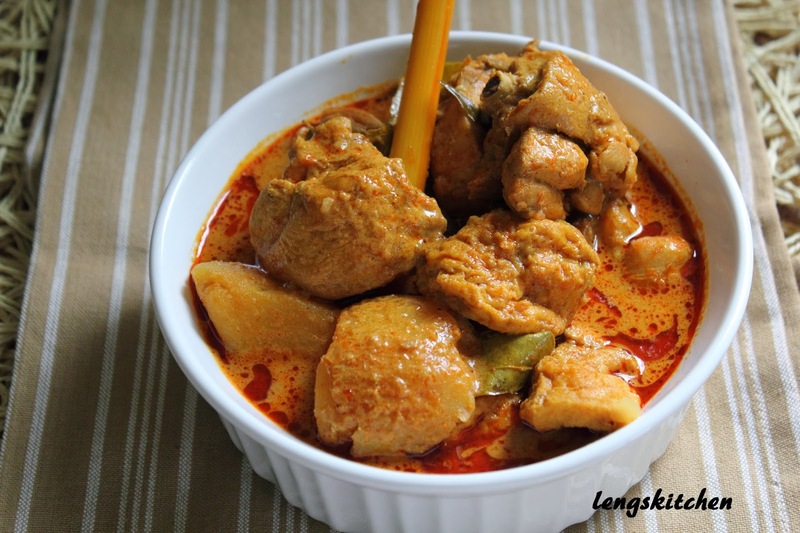 I have more than once tried making my own version of chicken curry from scratch. My mom has been supplying me with both curry powder and chili powder ever since I moved here, both of which she got all the way from Singapore. They are the best, or so she says, and I must admit that she indeed makes very good chicken curry using those two. 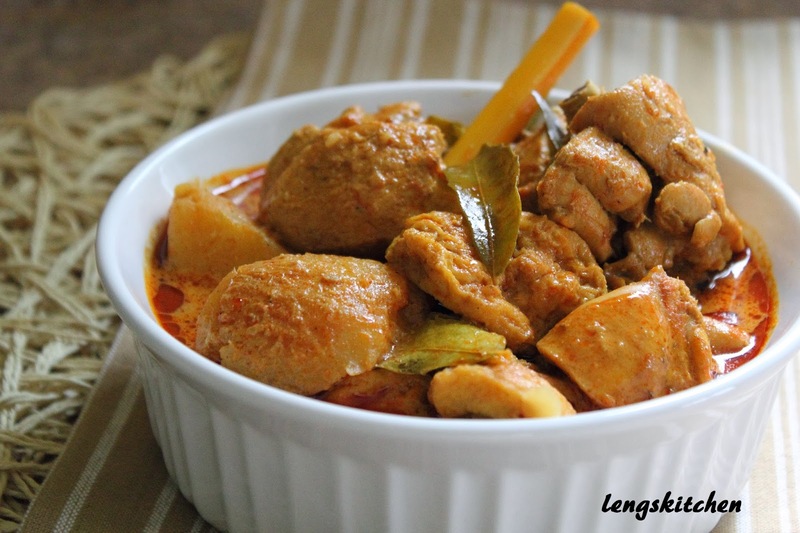 I, however, have never developed enough skill in making a pot of chicken curry as good as my mom's, but I am nonetheless glad to say that I am more than happy with this instant curry paste for now. It took me a while before I decided to make a post on this despite its simplicity. Well, good things are meant to be shared! Give it a try if you have the chance and see for yourself if it is good enough to remind you of home! 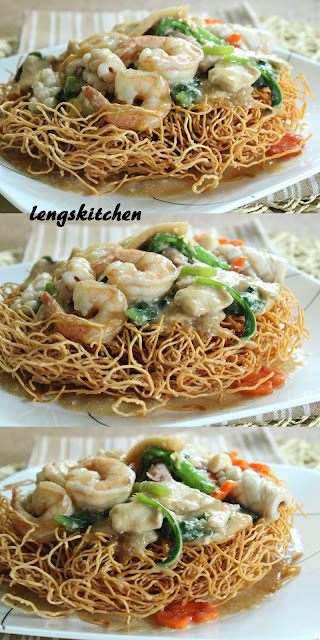 PS Absolutely great served with plain rice, Economy Fried Vermicelli 经济炒米粉, bread (especially the fluffy white kind; never mind the nutrition value for once - and try toasting it! ), and roti canai! It has been a real long break from blogging - my head had been buried in books in the past couple of months in preparation for a couple of exams, we made a trip back to Malaysia for my sis-in-law's graduation, I headed off for a reunion trip with my high school friends in New York City and Chicago soon after returning here, went for a college interview and thankfully, I got accepted! I had the joy of hosting two of my friends who extended their stay in the States after the reunion, and it was just within the past week did I slowly resume cooking after months of going inactive. One thing that one of them, Siew Hoon specially requested for - the Little Sheep Mongolian Hot Pot 小肥羊火锅. She has always been a huge fan of this, and it was thanks to her that I was first introduced to this Mongolian Hot Pot during our college years about 6 years ago. One of her must-have in the hot pot - yam! The remaining yam that did not end up in the hot pot - they ended up right here - steamed yam cake! 1. 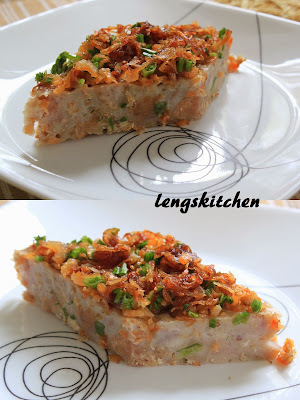 As much as it feels so tempting to load up on yam and dried shrimps, do not overdo them - or you risk ruining the cake's texture - it may turn out hard. You can, however, garnish as generously as you want before serving it. 2. Check that you have enough boiling water in the steamer to last through the steaming process. I ran out of water in the steamer once, and it totally ruined my timing. 3. Let the freshly steamed yam cake cool down completely before serving them. The shape holds better as they cool down - it makes cutting easier. Finally, a break from all the readings and writings! Well there isn't really a break, I am just declaring one myself lol. Here comes my next simple post (can't believe that it has been close to a month since the last!). The truth is, I had made this dish with all the pictures taken a long long while ago. Only, the writing part and the assembly of everything obviously did not happen until now. 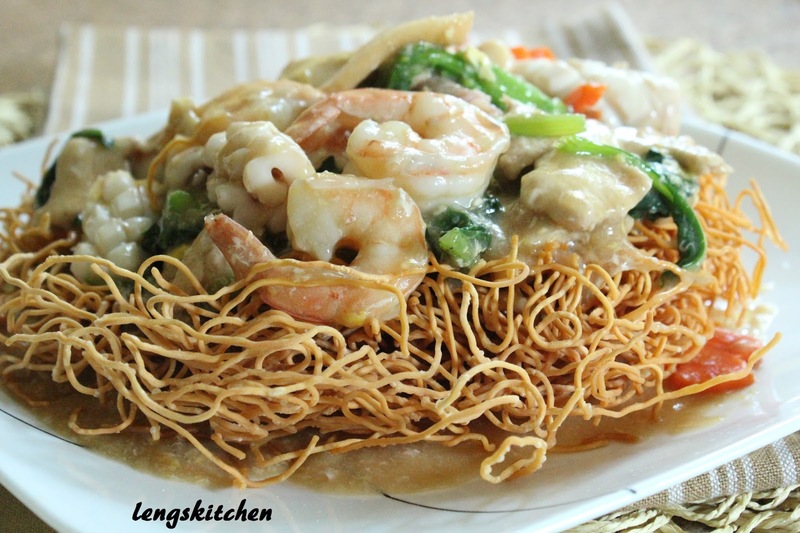 This dish was a call I knew I had to make to answer my then serious cravings for wat tan hor 滑旦河 (a Cantonese style of pan fried kuey teow in egg gravy). 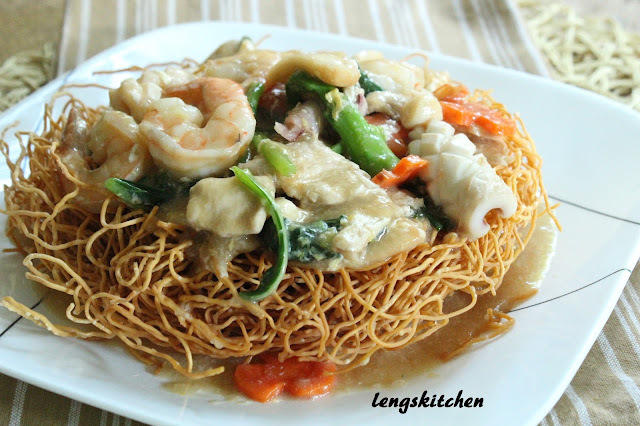 Again, with what I can find rummaging through my fridge and pantry, this Seafood Crispy Noodle 海鲜生面 is the closest that I can get. It was through my mom-in-law when I first learned how to cook the wat tan hor. 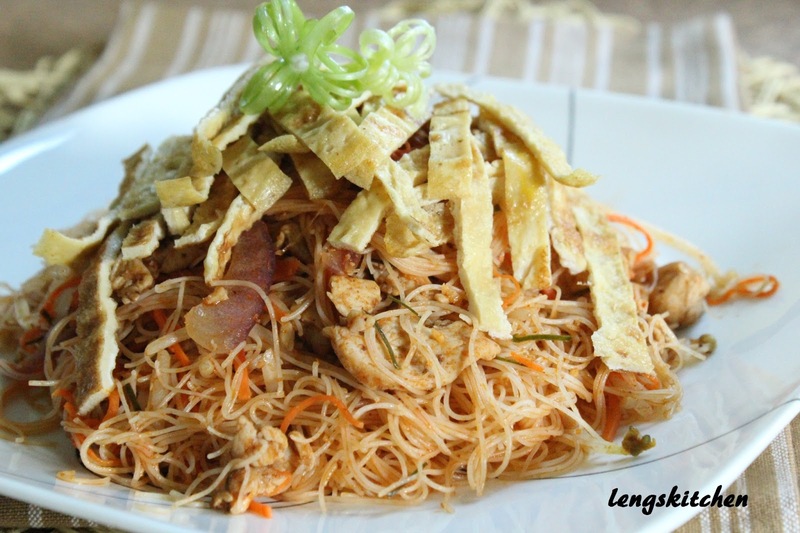 She wasn't exactly making the wat tan hor (using kuey teow) then; it was the vermicelli version of wat tan hor 滑旦米粉 (using vermicelli). The vermicelli version of wat tan hor is better known as something else but oh well, my personal translator is off at work! lol. I shall be back and make amendments to that when I get the chance! Anyway, you can be using any kinds of these noodles - kuey teow 河粉, vermicelli 米粉, chow mein 广东幼炒面, or yee mein 伊面 even. Oh, how I wish I can get the yee mein that we so commonly use for the Malaysian style of claypot yee mein 瓦煲伊面 here! Life is getting much more hectic! I started taking a writing class just recently and that has taken so much of my time! But as much as I find it hard to believe it myself, it has been fun so far! There is so much to learn, plenty to share and even more to brush up and work on. Anyway, that explained why I have been missing in action for such a good while. The bad news? Now that I have got the class rolling (despite just one single course), this rather messed-up routine of mine will be tagging me for now... at least until the class officially comes to an end. The bad bad news? It has really siphoned almost all of my time and energy in me. I have less time for house chores, less time for grocery shopping and almost no time left for any action (big or small) in the kitchen. Baking has altogether ceased, the kitchen can go untouched for days at times and all that I have now is probably just enough time to make a quick bite on especially days with classes and others with a due date to meet. Lunch and dinner have become exceptionally simple - they are whatever that I can make out of the few ingredients that I can find sitting in the pantry and fridge. This - the blogging - is one that I'm not entirely willing to forgo. In order to make this workable for me, I believe what's being blogged about from now will be a whole series of real simple cooking. It probably is time anyway to think and get serious about filing those 30-minute meals recipes that everyone can benefit from at some points or another (in my case, almost all the time now). Here's the first one on the list! Tom yum fried vermicelli! It wasn't that long ago when I first had this. Mom was the first to discover it in the morning market that she frequented. It definitely was a love at first taste for her. Sure enough, she soon recommended that I tried that too and that was... WOW! Pretty unique, honestly! It is far different from the usual soup version of tom yum that we are so accustomed to. This is a real great variation to cooking using the tom yum paste. Words, however, won't do justice. You have to try it for yourself! 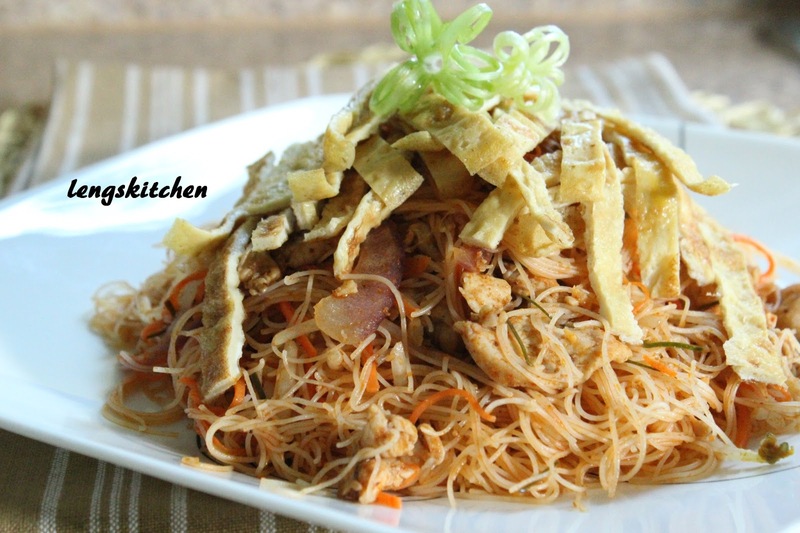 Here's a list to what I would think as essential to whipping up this dish - vermicelli, meat and/or seafood (any of your preferred choice), bean sprouts (that will be the main source of fiber! 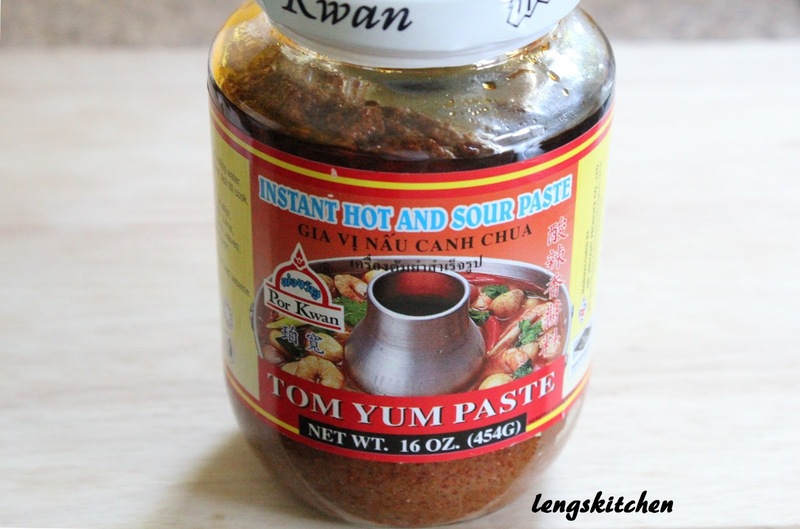 ), a carrot (for an extra hue and crunch) and of most importance - the tom yum paste. 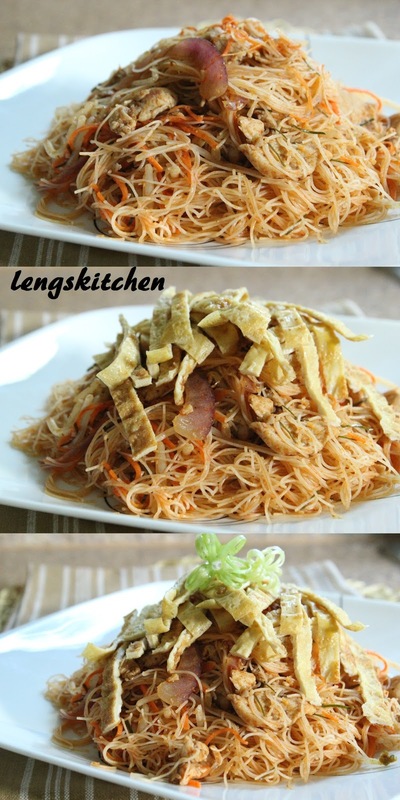 Find a real good brand that you like because that ultimately will be the key that unlocks every potential this tom yum fried vermicelli has. Just one last thing capable of adding a little magic to the dish - a few leaves of kaffir lime. It always is a huge plus if you have them but worry not if you don't - it's still gonna be fine. You won't need a bunch, just a couple should suffice in giving you that hint of lime and fragrance. 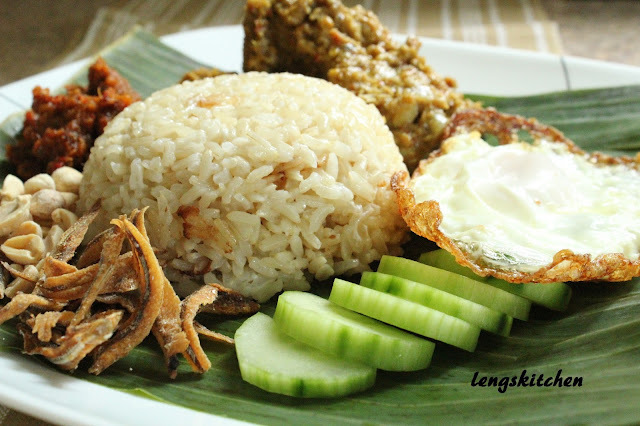 MalaysianFood highlight - the Nasi Lemak! I have been planning to make a post on this for a while now, yet I have never gotten enough motivation to get me kickstarted each time. And so I fell victim to procrastination, time and again. 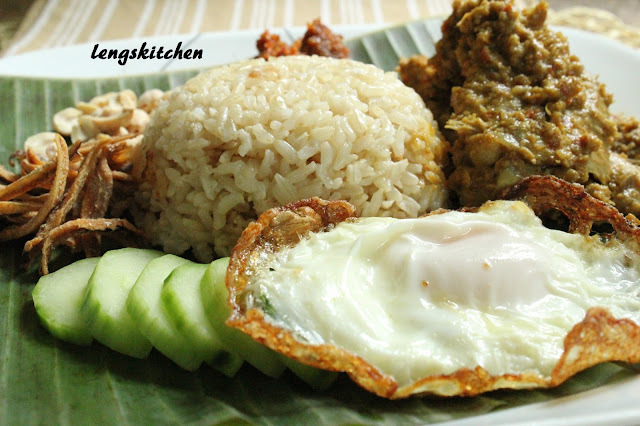 There are some pictures securely stored in my "to-blog" folder taken from my previous Nasi Lemak cookout quite a while ago, but you know how some stuff just sadly no longer appear as appealing after you look at them for a good while? Well that happened in this case of mine; and that's me deciding to continue putting that thought on hold, delving further into the "that can wait" mode... right until now. The cue to make this came out of nowhere just over this past weekend. I have no idea what triggered it, but one thing rolls on to another - I went on to get all the ingredients needed, and the following day - I was all set on recreating the sinfully delicious dish for the day while finding myself busy snapping away with a camera in hand. I guess it's true that you really should follow your passion at times - because when you have got that in hand, you are as good as being halfway through it! The battle will be a breeze! Well not totally, but it just feels right to say that simply... lol. 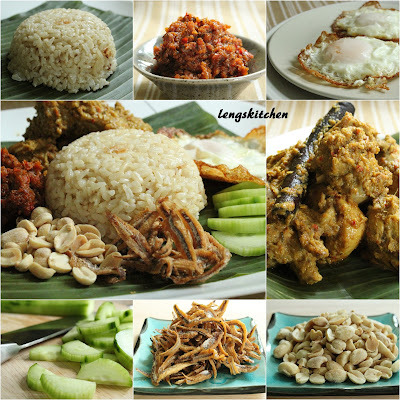 So here's a post specially dedicated to the famous Malaysian Nasi Lemak! It probably is safe to say that every Malaysian and Singaporean love their Nasi Lemak... with the coconut milk rice infused with the aroma of pandan (screwpine leaves) and ginger served with an egg, then garnished with anchovies fried to a perfect crunch, fresh roasted peanuts, refreshing slices of cucumber and a liberal serving of sweet and spicy sambal... YummMmm... it's just hard to not love everything about it really! 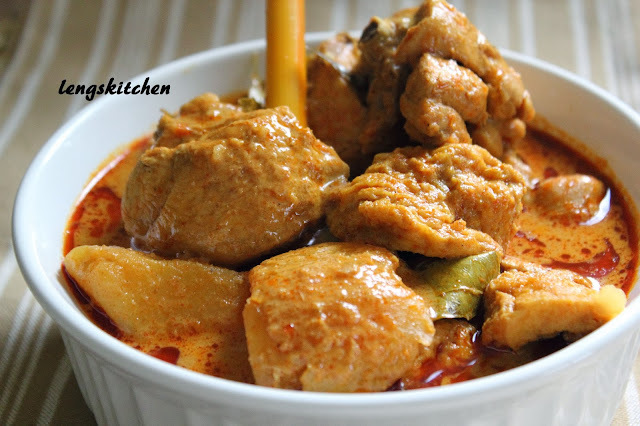 Just like all the other times I had made this in the past - I chose to serve it with the Chicken Rendang. There are plenty of other options out there - thanks to the bits and bits of creativity juice contributed by the many passionate people (that's the passion again!) out there. 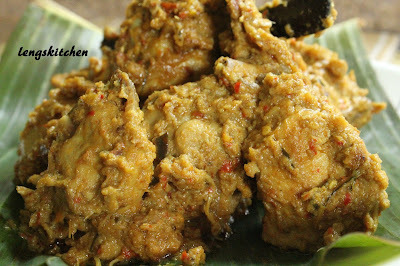 These days, there are the choices of chicken or beef rendang, crispy fried chicken, sardine fish, sambal petai (stink bean sambal), sambal sotong (squid sambal), sambal kerang (cockles sambal), paru (beef lungs) and the list just goes on and on! The coconut milk rice recipe was one that I got from my mom - simple and straightforward in fact. This version of mine features the brown rice. Using that i=s definitely not a conscious decision made; the brown rice is what we usually have at home almost on an everyday basis. It can be substituted with the usual jasmine white rice - it's all a personal preference really. Just be sure to adjust the amount of water needed - pretty much just like how you would usually cook the plain rice - white, brown or even red. The sambal is really what I would think as the limelight of the dish. 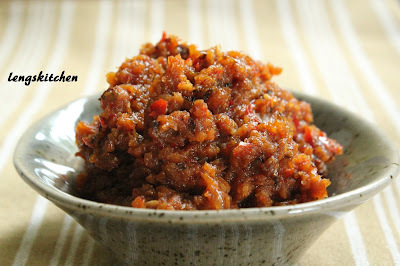 This sambal recipe is one that I adapted from Ju at The Little Teochew in her post on the Nasi Lemak Sambal Chili. I have so far been trying a different recipe each time I make the Nasi Lemak, in hope to search for the cream of the crop. With me stumbling upon Ju's recipe just recently, I think I am pretty convinced that I can now stop looking around - this is by far one of the really good ones that I have chanced upon. And the best part of it - it is made perfect even without having the need to include the belacan (shrimp paste) in its making. 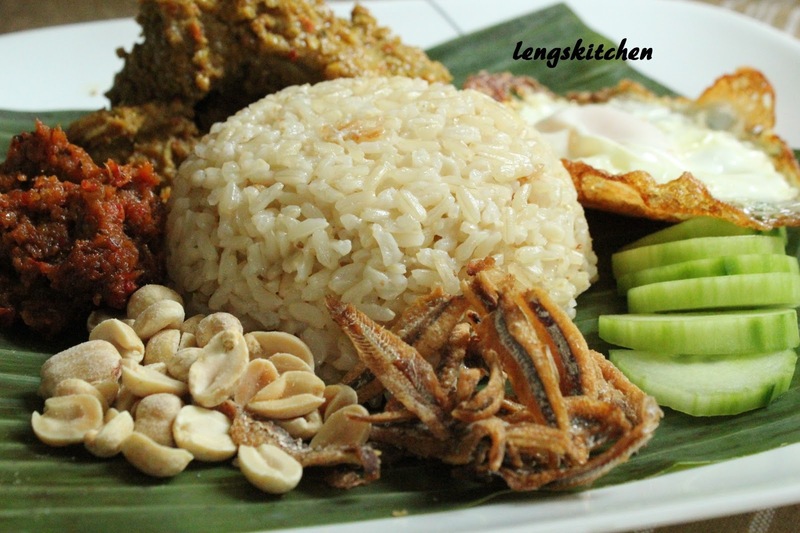 That's Nasi Lemak made a notch healthier!